THE LIFE OF A BAYMAN is an interesting yet tough way of life. It can also be very rewarding in more ways than just money. We get to witness amazing things that most people don’t get to see such as seals, whales, dolphins, different species of gulls, waterfowl, birds of prey, etc… Some of these animals don’t normally visit this area, but when they do – we get to see them. Even a random white tailed deer swims by from time to time. I love it. 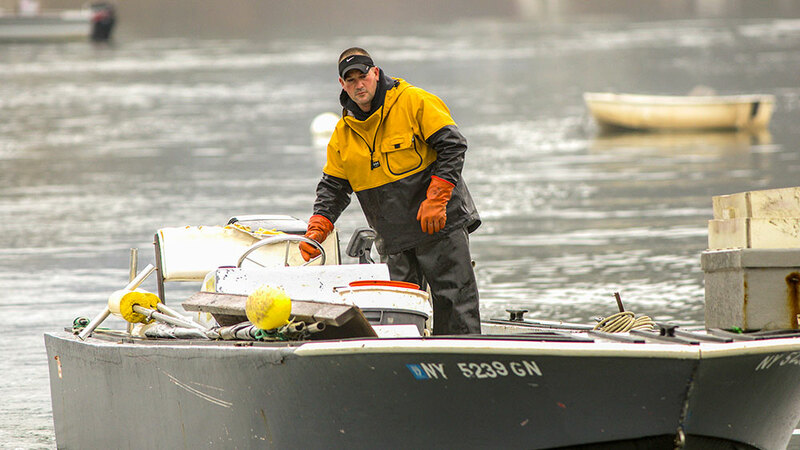 A baymen is always on call to help other boaters in need of assistance. Every year I personally tow in a dozen or so boats that either broke down or hit rocks. Sometimes even just to give them enough fuel to make it back to the dock. Our eyes are ALWAYS open. A typical day usually starts the night before staring at the weather channel because the weather plays a large factor in what the next day will bring. Wind, rain, sleet/snow, the temperature and moon phase are all extremely important. The first thing most of us do when we wake up is put the weather on one last time and make a pot of coffee. When i make my game plan, I gear up and walk down to my dinghy (small row boat used to get to the clam boat) and make my way out. (I’m fortunate enough to be able to keep my boat in front of my house on a mooring while some of the other guys trailer theirs daily). It’s the best work commute ever in my eyes. Once I get to the clam boat, I start it up, unhook from the mooring, and start my journey. When I arrive at the area I’m going to work, I grab my poles (up to 8 sections of 12 foot long aluminum pipe ranging from 1 to 1 5/8 inches in diameter). I hose clamp the lengths I need for the depth I’m working that day and attach my rake to it. After I’m set up and digging, I’m constantly paying attention to every move I make while pulling one the rake. One wrong twist or movement can hurt you. We pull the rakes with every ounce of strength we have from the first grab to the last. After 20yrs working out there its still amazing to me how much goes into catching these delicious little buggers. When the first grab is finished and brought into the boat, it gets dumped on a rack that has multiple bars an inch apart to be culled, sorted and counted. The reason they are spaced one inch is so that the baby clam seed can fall back into the water. The basket and teeth on the rake have the same spacing. It’s a rather simple process but very physically demanding. At the end of the day when everything is counted, sorted, bagged and tagged I start my journey back to the mooring to unload my catch and put the boat away until the next morning when I start the whole process over again. I love every second of it and the feeling of accomplishment is unparalleled in my eyes. There is something to be said for literally earning every penny made for the day. Even a bad day is a good day because you are out there working as hard as you can and never really come home empty handed.